Once again I’ve been lax in posting, being busy with other things, namely writing on the memoir, still some drawing, and moving big rocks around behind my apartment building, where I’m making a terrace and a French drain. For fun, like a bus driver’s holiday, it’s a landscaper’s retirement. Meanwhile I note that nobody seems to have been particularly bothered by last week’s digital silence. My apologies for doing this blog without a schedule, but it is what it is. I do have a vague list in mind of subjects to bloviate (blogiate?) about, though without clear priorities. There is a foggy plan to keep on posting drawings for my coloring book YE GODS! and to start serializing my novella BAT IN A WHIRLWIND, which will happen as/if I manage. Since I’m feeling the need to think about something besides the Aztec god Huehuecoyotl (Old Coyote), my youthful tribulations of fifty years ago, and earthworking, I’m going to write this time about more of the free stuff I’m pushing on this website. Today I’ll tell you about the only play that Fyodor Dostoevsky almost wrote, and posthumously at that. Being a dramaturge impressed me mostly with the transitory nature of theatrical art. All that’s left of that dramatic triumph now is this text, a rather good videotape, and a horrific memory of the elderly Porfiry character freezing in mid-sentence for several interminable moments. Wrong, I’ve also still got a little Victorian mirror that hung over Porfiry’s desk and a continuing acquaintance with the fellow named John who played the student friend Razumikhin. More or less dizzy with that two minutes of local fame, I went on to “extract” a one-act play from a short story by another favorite Russian writer, Maxim Gorky, who also wrote magnificent plays you may have heard of, like THE LOWER DEPTHS. Some might call it adapting but whatever. The story is titled for its main character, CHELKASH, but I call my play more thematically SPOILS. Admittedly, it won’t be easy to stage as it mostly happens in a small boat being rowed on a dark sea. My thought is that it would work much better as a screenplay for an intimate video incorporating the nocturnal atmosphere and dark ships looming in the harbor. SPOILS and my other theatrical pieces are also available for free download, reading, or production. Check them out too. There’s some unusual, if not downright odd, historical and experimental stuff. Giving myself a brief vacation from posting anything, I got lost in a great trance of drawing for the YE GODS! 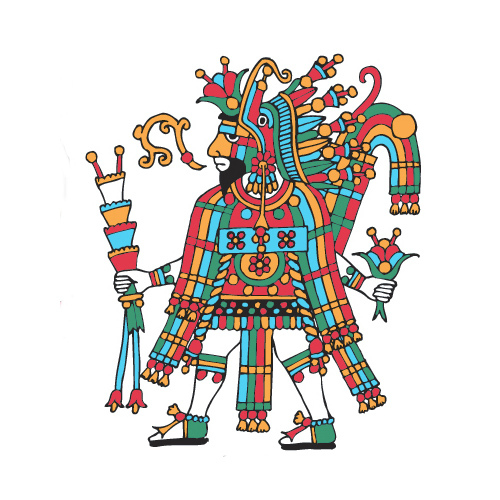 coloring book, closing in on Icon #6: Huehuecoyotl. Watch for it! Back on my home page I remarked that this blog would be egregious essays, and now I’m going to write about something exquisitely egregious. Last week I also took a break to wander around the consignment stores in my neighborhood. It’s always fun to admire lovely people, places, or things. Recently I’ve been trying to stop accumulating and instead to give things away, but I ran across something in my wander that I had to possess. As a birthday present I bought myself an intriguing tapestry. It bears a “Certificate of Authenticity of Belgian Art” from the Gobelin Center in Brussels stating that this is “a reproduction as good as the original work” from an 18th Century original in the “Tentures des Indes” series. The title is “Cheval drapé,” which means “draped horse” and isn’t very helpful. At 3’ wide x 4’ high, it fits nicely on the wall behind my work station and can be easily viewed, which I did closely for some days after hanging it. What a strange mix of creatures: horse (with groom), camel, flamingo, other birds, fishes, flowers, fruiting tree (looks like a pomegranate), and exotic shrubs. Is that a pineapple? What the…? I googled images for the title and found the tapestry available on amazon and ebay, as well as with a tapestry retailer. Looking up other Gobelin tapestries, I found examples using the draped horse in other settings and with other images like a South American Indian on horseback, a llama, and a black groom with bow. One had a Greek temple in the background without a groom. There’s even one with a horse of a different color and drape pattern, black groom, camel, llama, and monkey which truly defies understanding. There seemed no rhyme nor reason to the variations on this theme, yet I couldn’t help thinking that mine at least has to have some story behind it. And whether or not the designer had this in mind, here’s how I’m reading this tapestry. While the red-lined drape on the horse demands attention, the actual focal point is the camel looming there against the bright sky. Immediate given: this is in Egypt. See, there’s the desert and palm trees. Therefore the river in the foreground must be the Nile. Witness the African flamingo. So here we have a horse being led to water by a groom in a Greek chiton, and what a horse. Look at the gold rosettes on his harness, the apparently jeweled straps—and the regal brocade drape with satin lining. This is a royal horse. Okay, what royal horse would be in Egypt with a Greek groom? There could be only one, even if it was described in legend as black with a white star on the brow: Bucephalus, the beloved warhorse of Alexander the Great. It’s no wonder the Macedonian horse looks so warily at this first camel he’s ever seen. 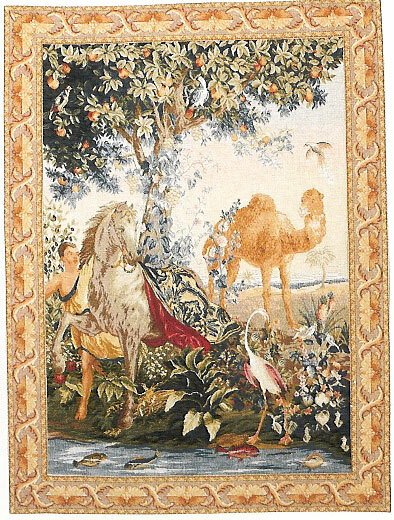 As far as I’m concerned, the title of this tapestry is now “Bucephalus in Egypt.” So there. And I’m pleased with my birthday present, even if it is a horse of a different color.